MANILA, Philippines - The girls of K-pop group 2NE1 are gearing up for their much-awaited comeback with Sandara Park sporting a new hairstyle. In the last few days, YG Entertainment posted teaser photos of 2NE1 members along with hints on their comeback date. For the new album, Sandara Park’s hair was shaved, showcasing a side undercut. Her photo that was posted on Facebook and YG Entertainment’s official blog also carried the numbers “2012-0705,” which fans are guessing would be the date of the album’s release. Sandara Park always gains attention with her funky hairstyles. Last year, she created a buzz when 2NE1 released their second mini-album. When 2NE1 started promoting on TV shows, Sandara Park sported an anime-inspired hairstyle similar to Dragon Ball’s Vegeta character. 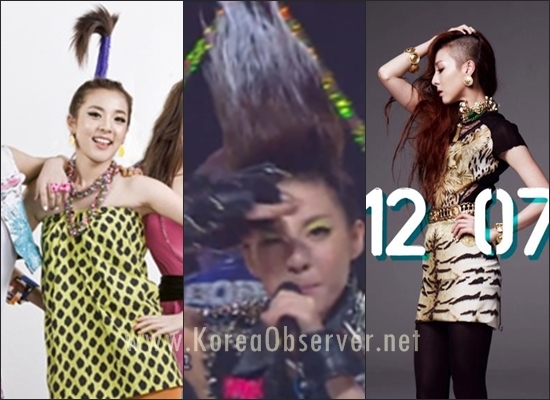 In 2009, when 2NE1 debuted in the K-pop scene, Sandara had her hair styled like a palm tree. 2NE1 will start promoting their new album on SBS “Inkigayo” on July 8, according to a tweet by Minzy. In addition, 2NE1 will be busy preparing for their world tour. The concert, dubbed as “New Evolution: 2NE1 Global Tour,” will kick off on July 28 and 29 at the Olympic Gymnastics Stadium in Seoul. From Korea, 2NE1 will head to the US. They will hold concert on Aug. 17 at the Prudential Center in Newark, New Jersey and on August 24 at the Nokia Theatre in Los Angeles, California. In September, 2NE1 will hold the global tour in Japan. They will perform in Osaka on Sept. 1 and 2, Nagoya on Sept. 7 and 8, and Yokohama on Sept. 11 and 12. For their global tour, designer Jeremy Scott will supervise 2NE1’s wardrobe. The choreography will be handled by Travis Payne, who worked as choreographer for Michael Jackson’s “This Is It” concert, which eventually became a film after Jackson’s death. In 2010, Payne visited Cebu to choreograph the Cebu Dancing Inmates video using Michael Jackson’s “Thriller” song. The video became viral on YouTube. On her me2day account, Sandara Park posted that in their world tour, they will be performing with an all-female band that includes Divinity Roxx, who worked as musical director in Beyonce’s concert.